Home Invasion celebrates Steven Wilson's victory lap after the chart success of 2017's To the Bone. Still, he says, there are more places to plant his flag, mountains to climb. 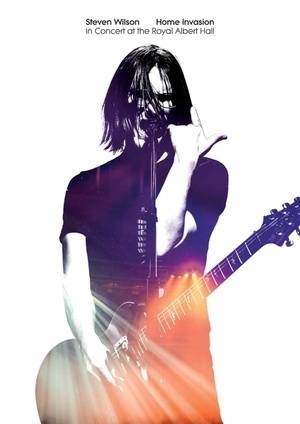 In late March 2018 Steven Wilson returned to his hometown, London, for a three-night stand at the venerable Royal Albert Hall. The final of those three nights was recorded for a live film titled Home Invasion: In Concert at the Royal Albert Hall via Eagle Rock Entertainment. (A limited edition deluxe vinyl edition will arrive from Caroline International on 22 March 2019.) The release is available in multiple formats. Wilson will arrive in North America for a series of dates beginning 15 November (see below), though he is performing in other territories before that. Wilson recently spoke with PopMatters about Home Invasion, To the Bone and his strange relationship with the lands where rock 'n' roll began. When did the idea of Home Invasion present itself? A couple of things converged and made it a perfect storm in a way. There were suggestions over the last three or four years or three or four tours that I've done that I should document them as a live concert recording. I've been slightly resistant to that idea because I think it's very hard to capture the spectacle, the feeling of being in a room and seeing a live show. But we were doing three nights at the Royal Albert Hall. It's pretty much my favorite venue in Europe if not the world. Doing three nights kind of takes the pressure off. When you know you're being filmed, you get a little bit self-conscious. You don't relax as much as you would like to. The opportunity to film on the third night at my favorite venue, a venue which also looks absolutely spectacular, beautiful on film, appealed to me. We had two days to get used to the room, get used to the dynamics of myself and the band and the audience. When we came to the third night, I was very relaxed. I didn't feel self-conscious at all. Hopefully, that comes across in the film. I also figured it was about time and that not everyone is going to have the opportunity to see the ­To the Bone show for real. It's obvious that the band knows the material but there is a spontaneity there. I hope so. I think that's also down to us being very relaxed on stage together. We have a lot of fun. Something people mention about the current band and about myself on stage is how much fun it seems like we're having. We really are. It's very relaxed. It's quite informal. The material is quite demanding. It's a three-hour show. Musically, it's not complicated but it's also not 12-bar blues. It takes a lot of concentration. But we put a lot of work into preparing, rehearsing, getting the repertoire up to scratch, preparing the visuals, making the films, making the animations. Working out the quadraphonic sound. By the time we actually started the tour it was like everything was there. I felt like I could finally relax. All of the preparation, all of the thought and imagination was done with. I have to say that I love being the Master of Ceremonies. I know it's good. I know it's a spectacular show. I know it works. I just step back, enjoy it and revel in the experience of being in the center of this amazingly spectacular show. I think that does come across in the way I interact with the audience and the rest of the band. Was the live arena something that was immediately comfortable to you or did you have to work at figuring out how to communicate with the audience? Definitely the latter. Honestly, I never thought I would be able to be a frontman at all. When I began my career, I always imagined I would be the producer/songwriter in the background and that I would work with other performers and singers, particularly. That was certainly true when I started. I had a great project called No-Man with a great singer named Tim Bowness, and I was just the guy producing and putting the tracks together. But Porcupine Tree came along, almost by accident. That was a solo project and I had to teach myself how to sing and to write lyrics. That became a victim of its own success in a way. Around the second or third album it was still a solo project but I started to get more and more pressure to play live. I found myself thrust into a situation where I had to be a singer and I had to be a frontman and I had to interact with the audience. Honestly, it's taken me the best part of 25 years to learn how to do that. I still feel that I'm getting better. It really comes down to one thing and one thing only: That's confidence. I know the audience is on my side. I know the show is good, I know the musicians with me on stage are incredible, world-class. I know the guy out front doing sound is amazing. All of these things are about trusting the people around you. That puts you in a much more comfortable scenario. All of those things have conspired, along with practice. Now, I kind of enjoy being the frontman even though that was not something I ever intended. It has to be gratifying, then, to have three nights at Royal Albert Hall. Not just in terms of, "hey, people like me", but in terms of, "I've realized something I didn't think possible earlier in life." Absolutely. Stepping on stage at the Albert Hall to do three nights in my hometown is, in many ways, a dream fulfilled. Like a lot of kids, when I started, I wanted to be a rock star. I know that sounds like a slight contradiction of what I said before but, honestly, when I was 14 to 15 years old, and I was listening to Prince and seeing David Bowie on TV, I wanted to be that guy. Now I'm playing a place that many of the people I admired played. It feels like a vindication for lots of hard work. If I'm honest, I wish it had happened a lot quicker. Five years into my career instead of 25 years into my career. It's been a tough road to get to this point. But I'm still on an upward trajectory in terms of my profile, my record sales, my ticket sales. In a way, if you had given me a choice, 25 years ago, between longevity or to burn very brightly for a very short time, I'm pretty sure I would have taken the longevity option. You'd been to shows at Albert Hall, you'd seen film of other artists there. Did you have moments where you said, "OK, one of these days, I'll be standing there." I must have. The first band I saw there, when I was about 20 was 10,000 Maniacs. I remember being absolutely in awe of the venue but being very disappointed in the sound. It's a tough room. It's tough to get a good sound. It doesn't suit everything. It's essentially been designed for classical repertoire. It has ambient acoustics. If you're a band that plays guitar pop, as 10,000 Maniacs did, or if you play metal or punk or hip-hop, whatever, it actually isn't a very good room. But it's a perfect room for what I do. I saw David Gilmour there a few years ago, and it was perfect for him. His sound was immaculate. You realize that there's certain kinds of music where it's more about the texture, and it's more about the space. So I remember that first time being disappointed in the sound and being a little bit worried about how it was going to sound. But I needn't have worried. I feel quite comfortable there. There's a strange quality where it's quite big but it feels intimate. The audience is wrapped all around you, so it's not like a traditional 4,000 venue where the guy at the back is literally a quarter of a mile away. Here, the guy with the cheapest ticket is still within eye contact. It feels warm, it feels intimate. That's the kind of thing you can't anticipate until you actually walk on stage there. It seems like your current band is absolutely right for you at this time. I think this is my favorite iteration of the band because everyone feels like they're working toward a common goal. I say that because I've had a few superstar musicians in my solo band before, extraordinary musicians, but there was always a bit of a fight going on internally. People who wanted to show off what they could do. That's not always in the best service to the music. I feel now that everyone is trying their best to be in service to the music. There's also that very important but elusive quality, chemistry. That comes with time. Alex [Hutchings], the guitar player, joined me for this album cycle, but the band has otherwise been together for a few years, so there is a very strong bond and a very strong chemistry. There's that intuitive communication you get through working with musicians for a long period of time. When I put a solo band together I knew that I wanted to be the worst musician in my own band. That's probably a strange ambition to have but there is a reason for that and that is because I want these guys to blow me away every night. I want these guys to do things that I could never do. But I want them to do that in service to this music. That's what happens night after night. What could be better? This film and live album come on the back of To The Bone. I sense that there were some people who probably came into the fold for the first time with it. Very much so. Sometimes I hesitate to say it because some people can take this in a very, very negative way: But this album has a much stronger pop sensibility. Pop in the way that The Beatles are pop or Abba is pop. I'm not comparing myself to those great artists. But the idea is that these songs focus much more on my songwriting and much more on hooks. And melody. There's less of what you might call the conceptual elements, long solos and tangents. To The Bone is a more direct, more accessible, more immediate record. I think it's a great doorway for people to walk through into my particular musical world. Two or three songs, in particular, had a lot of radio play, which is almost unheard of in my career. What that's resulted in is new fans and new people listening to the music and using the album as a doorway to walk into a substantial musical universe. That's fantastic to see. Anecdotally, when I first had To the Bone I was listening to music with a friend of mine who doesn't always share my taste, but she really enjoyed it. So: Well done, Steven. [Laughs.] I've heard other people say similar things. That's wonderful because I never thought of myself as making "difficult" music. I always thought of myself as making music that was very easy to enjoy. So I always slightly disappointed when people found it difficult or intellectual. I think there was a more conscious effort with To the Bone to keep things on the right side of accessibility without sacrificing any of the ambition. How do you feel about your relationship with North America at the moment? Do you feel that you've broken the markets you want to or do you feel that there's still some legwork to be done on the continent? America's really tough. I think I'm right in saying that America is tougher than it's ever been if you play music that comes from the tradition of rock. It seems to me that there are two places in the world, and the UK is the other one, where rock music has pretty much gone underground. It's made way for urban and DJ-oriented music. I have no problem with that music but it is so dominant that rock music has almost become the underground music of the day. I find that when I come to America I do the least amount of promotion, find the least amount of interest from the press, that is disappointing because it is there and in the UK where rock music was born and where rock music thrived. I wonder if the two things are connected: Because these two countries were, historically, the kind of stronghold of rock 'n' roll and rock music and progressive rock that they are so much the ones to essentially turn their backs on it. I'm not talking about the fans. I'm talking about the mainstream media. Honestly, I've found that America is two steps forward and three steps back. Every time I think that my audience is expanding it seems a little bit tougher to get to them. The interest from the media seems a little bit less forthcoming. I keep coming there, and I keep seeing the audiences show up, but I don't know how they're finding the music. 12/5 – Baltimore, MD – Rams Head Live!